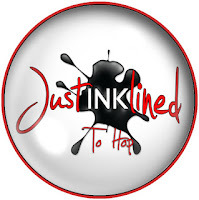 This is my first ever Just Inklined Blog Hop! If not, don't worry you can hop on to the start from here! use flowers & lace on our creations! if not stick around to hear a little more about my card! a little love at each stop! The DP I have used is from Papermania & has been in my stash for an age! The flowers & leaves are made using Marianne Creatable dies. I coloured Renie with my trusty Promarkers. She's such a game old bird is she not? With a great Attitude to life! George Michael I immediately thought of this image! I have added a little sentiment to finish off the card! The inside of the card is decorated too but I didn't get a photo! Great fun Dawn !! The image is fab and love that green abd purple together !! Looks like someone is having too much fun on your amazing card! Love the purple and green color combo! Super sweet card. oh she's such a doll lol! gorgeous card. So cute, and sure to bring a smile! What a fun image! You have the song Freedom stuck in my head now! I can just picture Renie motoring down the sidewalk singing it at the top of her lungs!! Great card. dawn, this put a smile on my face! Such a fun image and colors!!! What a wonderful and happy sentiment and image! LOL Wonderful work! Thanks for joining the Animal Crackers Challenge at Southern Girls! This is so cute Dawn! I love that fun image and your gorgeous color combo!! Thanks for joining us at Crafty Calender this month! what a fun card. maybe she needs a little around her knee highs :) great job! Dawn this is gorgeous and very creative. Love everything about it. Wishing you a fab Tuesday. Love this!Great colours and that image-well,I have to have it!Thanks for sharing it with us at ATCs with Attitude. Super cute card! I love the flowers and lace. Thanks for playing along at Scrap it with a Song! Cute card, thanks for playing along with us this week at Catch The Bug. Fun card! I love how you used the flowers and lace. Great interpretation of the song. Thanks for playing along with us at Scrap it With a Song! Love your spark of humour! Great design to! Thanks for sharing with us at Card Crafter's Circle! I love your project! Thanks so much for joining our challenge over at CTB! I hope you will join us again very soon! What a great card is this, I love the image. Hello Dawn, so nice to see you again at The Squirrel and The Fox. I love this darling creation with the fun image and how true is that sentiment! Thank you for sharing with us, I hope to see you there again soon. So pretty! I love those ribbon roses. Thanks so much for joining our "Roll 'Em" challenge at Shelly's Images. Love your fun take on the challenge - Thanks for playing along with Scrap it with a Song. Very fun card! I love your coloring and the flowers. Thanks for playing along at Scrap it with a Song! Such a fun take on the 'Freedom' challenge! Thank you for playing along with us at Scrap It With A Song!